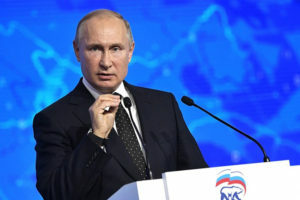 A poll by Russia’s Public Opinion Research Center, or VTsIOM, released on March 7 found that trust in Russian President Putin has fallen to 32 percent, its lowest level since 2006. The previous poll by the government-run VTsIOM released in January showed that trust in Putin was at 33.4 percent. The poll was held between February 25 and March 5, after Putin’s annual state-of-the-nation speech on February 20, which some viewed as an attempt on his side to improve his image which had been dramatically affected by the government’s extremely unpopular move last year to increase retirement age. According to the Kommersant daily, which cited data collected by the Mediascope media market research company, Putin’s address was watched by the lowest number of people in Moscow since 2014.